The right-hand side of this equation is called the Poynting factor after the British physicist who derived it at the turn of the 20th century. Example: What is the vapor pressure of water at 500 atm if the reference state is the normal boiling point? This choice of reference state implies T = 373 K and psat,ref = 1 atm. 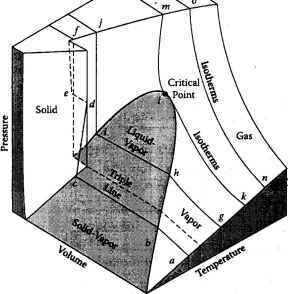 The molar volume of water at this state (from steam table A.1) is vL = 1.88x10-5 m3/mole. With these values, and converting the pressure difference to 5x107 Pa, Eq (5.17) gives a Poynting factor of 1.35, or pSat = 1.35 atm.